Chamber President Paul Regan would like to extend the warmest of season’s greetings to all our members and wish you and your business continued success for the new year! Paul says ‘Ballina has had a great year and we a very Thankful to all who has supported the Chamber of Commerce in every capacity. We would also like to take this opportunity to sincerely thank the local business community, and the general public who supported the Shop Local Gift Voucher Initiative, and hope you will continue to support ‘Shop Local’ in 2018. The chamber’s active participation on numerous forums, and joint committees with local authorities, development agencies and neighbouring Chambers, ensures that the key business issues locally are being represented, and incorporated into the decision making processes within the region. 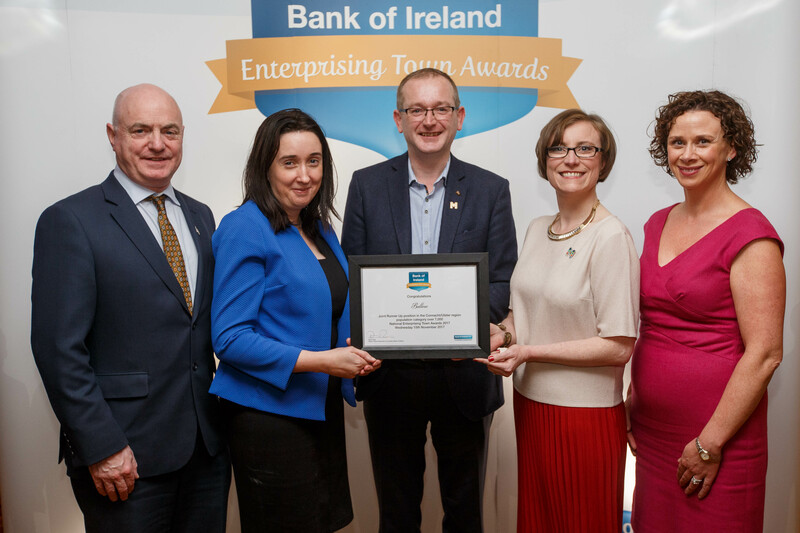 One of the many achievements of Ballina Chamber this year includes it being recognised and rewarded with a Runner Up award in the Connacht/Ulster region population category over 7000 at National Enterprising Town Awards 2017 sponsored by Bank Of Ireland. The awards ceremony featured 80 towns from around the country who came to the Tullamore Court Hotel for the awards ceremony. Featuring Peter Hynes, Mayo County Manager, Paula Prendergast Local Enterprise Office Mayo Paul Regan President of Ballina Chamber of Commerce, Mags Downey Martin Manager Chamber & Tourist Office and Catherine McConnell, Director of Services & Planning, Economic and Community Development with West Mayo Municipal District. Please note that our office is closed from Friday the 22nd December 2017 at 1pm and will re-open on Monday 8th January 2018 at 10am. Wishing you and yours a very Merry Christmas and peaceful New Year.